Why did Browner feel the need to tweet the president directly? It all goes back to last year, when Browner was a member of another Super Bowl winning team — the same team that the Patriots edged out on Sunday to claim the fourth Lombardi Trophy in the 55-year history of the New England franchise. Namely, the Seattle Seahawks. The Seahawks, of course, won the Super Bowl played in 2014 — the 48th Super Bowl game — and as is traditional for champions of major U.S. sports leagues, earned a springtime visit to the White House as a result. 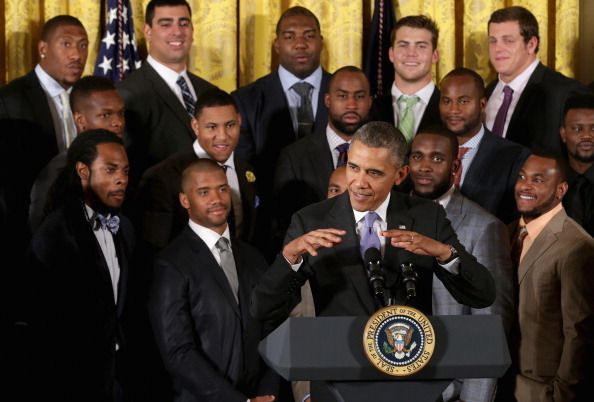 Browner was on hand for the visit, standing just behind Obama. But though Browner was an instrumental part of Seattle’s regular season run to the playoffs in the 2013/14 season, he was not permitted to play in the Super Bowl game, due to a suspension for allegedly violating the National Football League policy on the use of drugs. The cornerback was also suffering from a groin injury at the time. Perhaps because he was absent from the Super Bowl game in 2014, Obama skipped over mentioning Browner by name — wounding the 6’4″, 221-pound cornerback’s feelings. But even though he felt validated by his then-coach, Browner vowed that he would be part of another Super Bowl winning team, allowing him to return to the White House, this time to shake the hand of the president who snubbed him. By signing with the New England Patriots, and playing a key role in that team’s dramatic Super Bowl run, Brandon Browner has now achieved exactly that — and he let Obama know in his Tweet just hours after the dramatic conclusion of Sunday’s memorable game.